Heated driveways from Warmzone do more than just melt snow and ice from driveways and sidewalks, the snow and ice melt systems help preserve your landscaping by eliminating the need to use harmful salt and chemicals. In a nutshell, having an “eco-friendly” Warmzone snowmelt system is a way to protect the environment in your corner of the world. That may sound like an outrageous claim, but the facts are clear. According to Spring-Green, a recognized leader in the professional lawn and tree care industry, salt spread over asphalt and sidewalks to melt snow and ice damages lawns and landscape plants. When salt products are spread over streets and walkways, the salt inevitably splashes onto nearby foliage. The sodium chloride burns the plants and gets absorbed by the plants’ root systems. 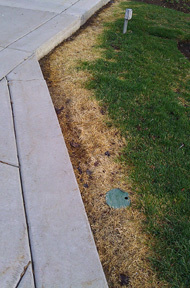 Spring-Green also states that using alternate ice-melt products aren’t the answer either. Commercial products contain potassium chloride which has a lower burn rate than sodium chloride, but fails to effectively melt the ice. What these alternate snow and ice melt products do is break the bond between the ice and the surface below, making it easier for you to remove the ice manually. Warmzone heated driveways and snowmelt systems are the best option to melt the ice and protect your landscaping. The radiant heat systems don’t use any harmful chemicals, and they efficiently melt the ice and snow so you don’t have to break your back shoveling snow. 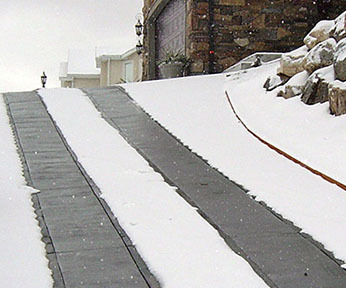 Snow melting systems can be installed in almost any driveway and can be retrofitted into existing concrete and asphalt. These energy efficient, eco-friendly systems feature state-of-the-art technology, but are surprisingly affordable and easy to install for any contractor or do-it-yourself expert. Warmzone carries both low- and line-voltage snow melting systems and will help you determine which system is best for your specific project. A variety of manual and automated radiant heat systems are available to keep snow clear of your walkways and driveway 24 hours a day. Wake up in the morning and relax while the automatic heated driveway prevent snow and ice buildup, or come home from a winter weekend vacation to a snow-free driveway and clear access to your garage. Contact us to learn more about environmentally-safe heated driveways and snowmelt systems. Warmzone snowmelt experts can help you design a heated driveway, snowmelt system or heated floor system that’s best for your property. Everyone seems to be seeing green nowadays. Words like “energy efficient, green construction” and “biodegradable” are used on a daily basis, and most of us believe that buying products with these labels means we are doing our part to save the environment. Auto makers jumped on the eco-friendly bandwagon, advertising vehicles that are gas-friendly to gas-free, which basically means 30 MPG and can run on mostly renewable E85 ethanol. What mostly renewable means, you’ll have to ask General Motors and Ford. Taking into account that Europe is considering implementing a 60 MPG minimum on cars, these early “gas friendly” cars look not-so-friendly. One possible way to be more green or to incorporate green construction into an existing home, is investing in products that run on renewable energy such as electricity rather than fossil fuels. It’s true that most of the world’s electricity is produced using coal, nuclear, and natural gas. While this may not seem like a better alternative, consider the totally renewable energy sources of electricity such as solar, hydro and wind. As fossil fuels become scarcer, these renewable energy sources will be the forefront in energy production. So where can you start? Most homes in America are heated using gas, and most of us can’t ignore the rising costs. Lowering the thermostat to barely tolerable temperatures may be your solution, but if you have children who are blissfully ignorant about the cost of heating, they have probably been tempted once or twice to warm things up when you weren’t looking. An alternative heating to gas that is hugely popular in Europe, and one that your children are guaranteed to love, is radiant heat. Oddly enough, radiant heat is actually the oldest form of heating homes, originating all the way back to the Romans. Yeah, they were pretty smart. When most of us think of radiant heat, we think of hydronic technology. For those of you who are still in the dark, a hydronic system heats the floor of a home through a heated water loop or underground piping. Drawbacks to these types of systems are a significant rise in the height of the floor, high cost, and difficulty to install. An even better form of radiant heating runs on electricity. There is no magic behind it, just a wire or cable that is easily installed beneath hardwood, tile, cement and even carpet. Some systems don’t raise the floor at all, while others result in less than a half an inch of floor buildup, and much of the system can be installed by any ambitious do-it-yourselfer. The best part? It is energy efficient, consuming only 12 watts per square foot (many systems are even less), and you are able to heat your home comfortably at lower temperatures because the electric radiant heat warms all the objects it comes in contact with. Allergy sufferers will be pleased to know that because electric radiant heating does not use forced air to heat, it won’t stir up dust, pollens, and other allergens in the air. Forced air heating systems also dry out your skin significantly, not to mention they take a fair amount of time to warm up your home. With radiant heated floors, your home heats up almost instantly, evenly and much more comfortably. Something not easily digested is that America consumes 43 percent of the world’s motor gasoline, 25 percent of its crude petroleum, 25 percent of its natural gas, and 23 percent of its hard coal. Investing in energy efficient products that run on electricity, like electric radiant heat, just might cut down these numbers and make your home a green home. Not to mention make you feel a little better, make your home warmer, and your wallet just might be a little thicker.